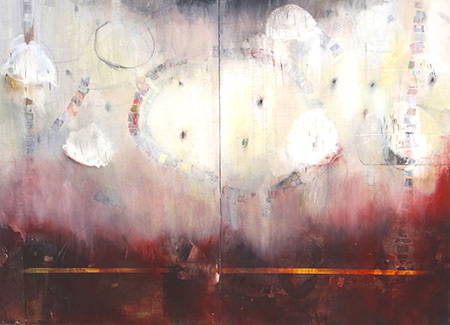 Long a fixture of the Portland art community, Lauren Mantecón has in recent years been based in Santa Fe, New Mexico. Her paintings, however, continue to evoke the misty, atmospheric sfumato of the Pacific Northwest. In her current exhibition, “Shape Shifting,” she continues a career-spanning exploration of those dreamlike zones within the human psyche and spirit where material and immaterial commingle. Deploying a visual syntax of orbs, ovals, and dense, limpid layers of oil paint, she conjures the experience of peering through a diaphanous veil or gazing into a pool of bubbling spring water. In “Greeting Jupiter” (2016) she renders these signature motifs in embedded collage, graphite and chromatic strata that grade from eggshell to crimson to old, dried blood. One of the show’s most virtuosic pieces, “Shape Shifter” counterposes a broad, lusciously textural gesture in pink and fuchsia atop a somber charcoal rectangle. Shimmering alongside, a matrix of orange lines connects a constellation of enigmatic dots, which hover in space like fireflies in a gossamer lattice. Throughout the exhibition, Mantecón’s brushwork pivots between translucence and hazy opacity, suggesting a kind of mysterious knowledge, barely discernible, just coming into focus.